SSSS is a fast emerging Software and Information & Technology Company that links and connects people and different Companies together. Our expertise is based on Web development, SAP, Oracle Database Administration, APPS DBA, ERP-Ebusiness Suite, Mobile applications/Mobile consulting, Mobiles software applications in Android, Blackberry, iPhone and iPad. Our goal is to conquer complexity with simplicity and to provide the best products with the greatest service possible. Also to provide long term support and services in all kinds of Software Development- Microsoft Technologies, Linux, Solaris and Unix Administration, Database. We are dedicated and committed to maintaining exceptional, unprecedented, and exemplary customer Support and satisfaction, trust and integrity by delivering quality products and World - Class services. We shall foster, promote and advance our client's requirements by delivering cost effective, ethical, reliable, and high quality solutions of strategic value. 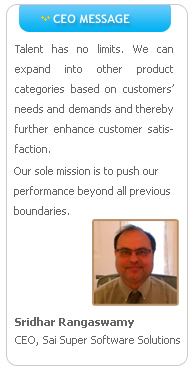 Our sole mission is to push our performance beyond all previous boundaries. Our aim is to be a high-performance, sought after Professional Organization that exceeds all customer expectations, serves and supports the community and a clean and friendly environment. 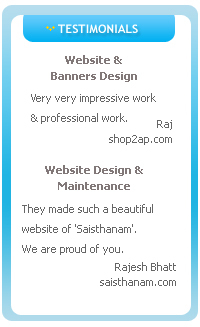 We provide services in Oracle ERP, SAP, Mobile Applications, Web & Portals Development including Development and Support.